Buck Riley in screen capture from “Hunted” episode. For the third time since January 27, someone from Saluda County has been featured in a national television program. Buck Riley is the latest “star,” joining Charles Baird, Debbie Shealy, Jason and Colton Price and Doris Goff, who appeared on the Travel Channel’s “Bizarre Foods” filmed at Shealy’s BBQ in Batesburg-Leesville and broadcast on Feb 7, and Bob and Ann Bowles who appeared in a “Tonight Show” skit on Jan. 27. Riley was in a Newberry County field in July 2016, when a couple came walking out of the corn. He knew something was going on when he saw the couple was accompanied by cameramen. “They explained what was they were doing, and I brought them back to my house,” Riley said. Before anything could proceed, Riley had to prove he had insurance on his vehicle and sign other papers. At the Riley’s Saluda County home, the couple, English and Stephen King of Hillsborough, N.C., asked of they could use the family computer to get on the internet. “They could only use it for five minutes,” Riley said. The couple and crew spent the night on the Riley farm, and Riley drove them to Greenwood the next day. The couple ended up in a location in Georgia, where they won the $250,000 by escaping in a plane moored on a lake. Only a small portion of the visit with the Riley’s was shown on TV. “They filmed enough to do ten episodes,” Buck said. Riley said he wasn’t sure at the time if the program would ever air, so he didn’t mention the experience to many people. By Meade Hendrix As a board member of the South Carolina Confederation of Local Historical Societies since 2008, I learned that the Myrtle Beach Chamber of Commerce was planning to offer a kiosk to museums over the state so more people in South Carolina could recognize and honor those who were inducted into the South Carolina Hall of Fame. Letters were sent to museums over the state offering to set up a kiosk in their museums for free. The kiosks are operated by Wi-Fi from Myrtle Beach. Each year the new inductees will be added to the program. The Saluda County Historical Society Board voted to accept this offer. This adds another dimension in history to the Saluda County museum. William Barrett Travis and James Butler Bonham were inducted into the South Carolina Hall of Fame in 2001. In 2016, David Drake, Dave the Potter, was inducted. His information will be added to the kiosk soon. Some other inductees from our area are Thomas Green Clemson, Pierce Butler, John C. Calhoun, Benjamin E. Mays, Roger Milliken, and J. Strom Thurmond. The kiosk is easily operated by touching the screen. The Saluda County Historical Society hopes adults and students will take advantage of the opportunity to learn more about the inductees and their outstanding contributions to South Carolina history. The South Carolina Hall of Fame dedicated on February 11, 1973, by Governor John C. West was created to recognize and honor those contemporary and past citizens who have made outstanding contributions to South Carolina’s heritage and progress. 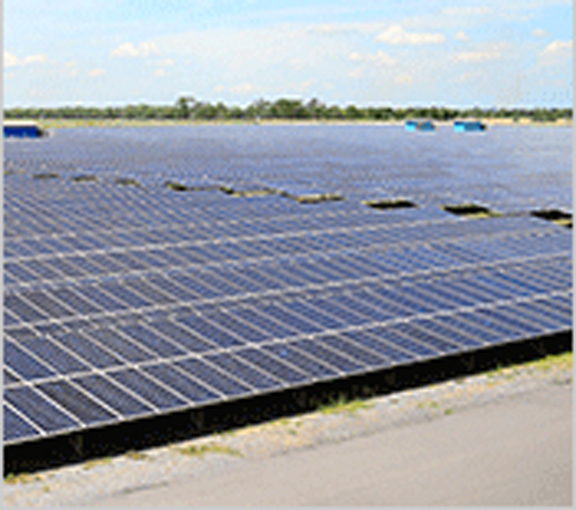 It is a nonprofit corporation conducted under a state charter. The South Carolina Hall of Fame is located in the Myrtle Beach Convention Center, Myrtle Beach, South Carolina. 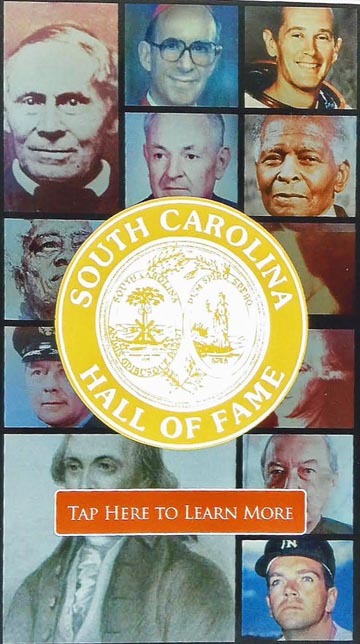 On September 21, 2001, Governor Jim Hodges signed into law a bill designating the South Carolina Hall of Fame as the state’s official hall of fame. Two jury trials took up much of the time during a two-week term of Saluda County General Sessions Court that concluded last week. In the other trial, John Tyler Padgett was found not guilty on multiple charges, including attempted murder, possession of a fireman by a person previously convicted of a violent felony (two counts), and pointing an presenting a fire arm. There as on lengthy sentence in the guilty pleas. Robert Michael Whittle Jr. was sentenced to 15 years for criminal sexual conduct with a minor 11-14 years of age, 2nd degree. Rocky John Boyd, uses of 911 unlawfully, time served. Treyon Hykeem Butler, burglary 3rd, Youthful Offender Act (YOA) not to exceed five years, suspended to time served and 30 months probation. Tammy Renee Cash, possession of methamphetamine 1st, 18 months, suspended to time served and 18 months probation. Llewellyn Chapman II, forgery, 90 days, suspended to time served and 18 months probation. Angela Rose Doto, assault & battery 2nd, time served. Clinton Clay Dukes, burglary 2nd (non-violent), 48 months, suspended to time served and 24 months probation. Devin Gregory Hite, contributing to the delinquency of a minor, YOA not to exceed three years, suspended to 30 months probation. Jason Lamont Johnson, resisting arrest (assaulting, beating or wounding law enforcement officer), five years, upon service of 63 days, suspended to 30 months probation. 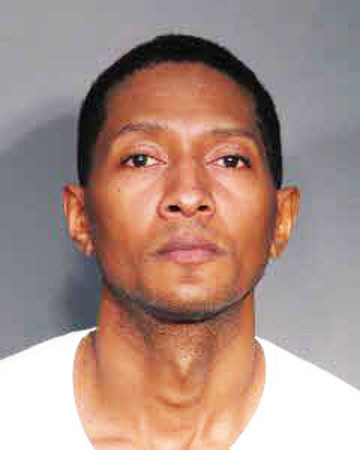 Marquis Raphael Lomax, forgery less than $10,000, time served. 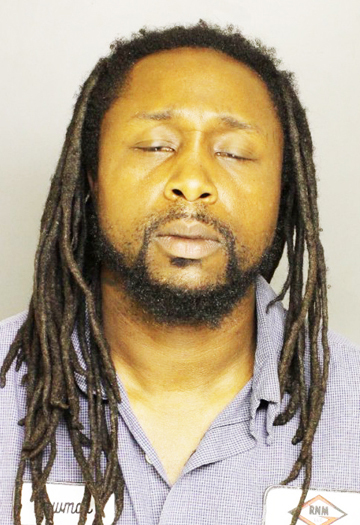 Michael Dwain Mains, possession of prescription drugs, time served. Kadisaha Nelson, forgery less than $10,000, 90 days, suspended to time served and 18 months probation. Natalie Nicole Nelson, forgery less than $10,000, 90 days, suspended to time served and 18 months probation. Marina Lee Olsen, burglary 3rd 1st offense, YOA not to exceed five years, suspended to time served and 36 months probation. Christopher Lee Oswalt, possession of meth 2nd, 60 days, suspended to time served and 36 months probation. Sheila C. Riddle, child neglect, 18 months, suspended to time served and 18 months probation. Corey Scott Ringer, domestic violence 2nd, 24 months, suspended to time served and 24 months probation. James Ollie Smith, breaking into an auto, YOA not to exceed three years, suspended to time served and 36 months probation; unlawful carrying of a pistol, YOA not to exceed one years, suspended to time served and 36 months probation. Dyan Cornelius Triplin, burglary 3rd, 24 months, suspended to 90 days and 18 months probation. Jerry Draken Wyndham, petit larceny, time served; harassment, 20 months, suspended to time served and 20 months probation. 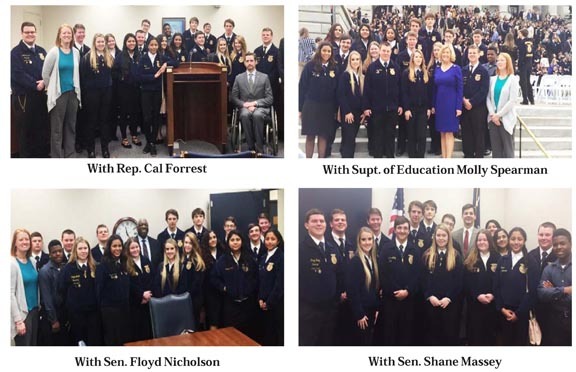 Columbia, SC….Eighteen Saluda High School agricultural education students attended the SC FFA-sponsored State Legislators Appreciation Ceremony in Columbia on February 22. 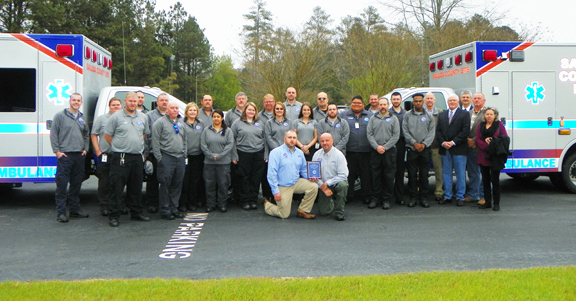 The students were accompanied by Amanda N. Crouch, agricultural education instructor and FFA advisor at Saluda High School, Ben Webb, health/physical education instructor and coach at Saluda High School, and Whitney Moore, guidance counselor at Saluda High School. The day began with a visit to Representative Cal Forrest. Next, the group talked with Senator Shane Massey in his office building conference room and then moved on to meet with Senator Floyd Nicholson. The Saluda Chapter then had the special opportunity to talk with our very own, Molly Mitchell Spearman, State Superintendent of Education. Chapter members were interviewed by her for a State Department of Education video and then posed for pictures with her at the front of the Capital. Next, the group joined with 1000 other FFA members, supporters, and guests for a ceremony on the State House steps where they heard from Commissioner of Agriculture, Hugh Weathers, and also Chairman of the House Agriculture, Natural Resources, and Environmental Affairs Committee, David Hiott. The week of George Wash-ington’s birthday was designated as National FFA Week in 1947 at a National FFA Board of Directors meeting. FFA Week generally runs from Saturday to Saturday, and encompasses February 22, Washington’s birthday. The FFA positively influences the young people of America by developing character and leadership skills, and preparing members for successful careers. FFA members are the leaders of tomorrow. Through agricultural education and hands-on learning, FFA members are preparing for more than 300 career opportunities in the food, fiber and natural resources industries of agriculture. With more than 610,000 members, the organization has a history of service and a legacy of leadership.